With Turandot and Lucia di Lammermoor, the Fort Worth Opera Festival continues climbing to new heights. 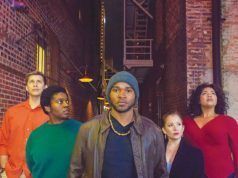 You couldn’t have asked for bigger contrast than the Fort Worth Opera Festival’s opening in Bass Performance Hall last weekend. Prince Calaf, who successfully answers the riddles and eventually wins her heart, was rising-star Dongwon Shin. A finalist in the last McCammon Voice Competition, the Young Korean-born tenor has since been singing major roles in Europe, Australia, and the United States. His voice is enormous and flows effortlessly at whatever volume he chooses, from caressing murmurs to all-out heroics. As a stand-up-and-sing opera, Turandot doesn’t give many clues as to dramatic range, but vocally he’s on his way. Shin’s singing of “Nessun Dorma” is already a major achievement. Christian Van Horn, a young, luxurious-sounding bass baritone, sang Calaf’s father, old blind Timur, with perhaps too healthy a ring, and Sandra Lopez as the slave girl, Liu, was hampered by a lack of vocal warmth. There were times you wished her strong, intense voice would take on a gentler quality with a softer edge. But these were minor blemishes on a brilliant show. 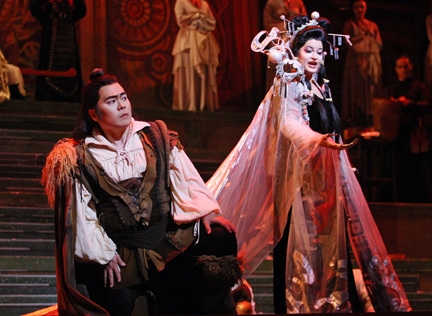 The scenery from Opera Cleveland, and in particular, Allen Charles Klein’s sumptuous costumes from the Dallas Opera, created a vivid fairy-tale look at ancient China, enhanced by theatrical makeup, wonderful wigs, and sensitive lighting. Conductor Joseph Illick coordinated the Fort Worth Symphony in the pit with offstage musicians and onstage singers, and his hand was sure and musical. The star of the evening, however, was stage director Daniel Pelzig. His massive forces were well rehearsed and moved through the pomp and pageantry formations without a hitch. He even managed to integrate some visiting Chinese acrobats performing tumbling and balance routines, which worked, although a balancing-stick act seemed one act too many. As Ping, Pang, and Pong, the frustrated courtiers who lament their fate in a scene frequently left to fend for itself, Ryan Taylor, Jamin Flabiano, and Keith Jameson were given a thoughtful progression of action that ended with their being helped by assistants into official court costume before a scrim went up and the full court was revealed already assembled upstage. There were many details such as this, surprising in a complex production with limited rehearsal time, that added dimension and interest to the evening, such as Turandot’s train-bearers, who spread the oversized fabric across half the stage and then crouched down waiting for their mistress’ next move, repeating the process in different arrangements every time she changed position; and acrobats dressed in red and gold Foo Dog costumes, cavorting happily through the triumphant wedding scene. When the final curtain came down, the sold-out house rose up with a roar, the loudest ovation I’ve heard there. It was that kind of evening. Lucia di Lammermoor, is at the other end of the Italian tradition – the early 19th century, the era of bel canto or “beautiful singing” – and it is a love affair with the voice as a musical instrument that does all of the tracks of a woodwind, with rapid-fire scales, arpeggios, trills, leaps, and long sustained notes that sometimes are shot into the stratosphere. As the most popular example to survive, Lucia is a prime showcase for extraordinary vocal and dramatic skills. Which brings me to Elizabeth Futral, who sang the title role on Sunday. She has the range, although the top is sometimes strident, and she hit most of the notes. But the voice is heavy, more suitable to Verdi, I would think, and much of her filigree work was muffled. Brightness of tone and sharpness of articulation went by the boards. With these drawbacks, the famous Mad Scene never really took off, despite her dramatic intensity. This is a fine singer and a talented actress, but I don’t see Futral in this repertory. Tenor Stephen Costello sang a passionate Edgardo, Lucia’s lover, and brought the afternoon’s first excitement as he denounced her in a raging fury in the Wedding Contract scene that galvanized everyone on stage and closed the second act in an emotional frenzy. The momentum carried into the next act, where what is usually a decorous wedding party was a falling-over-drunk Highland romp. Again the production is handsome, with scenery from the Cincinnati Opera, and costumes inspired by 17th-century Scotland from the Dallas Opera. Steven White, Futral’s husband, guest-conducted with style and sensitivity. There are more performances of both operas this week and next.